After my post yesterday about William Peter Marr, I decided to do some more research for the family of Alexander William Marr. Frist, I searched for articles on Trove for “Alexander William Marr”. 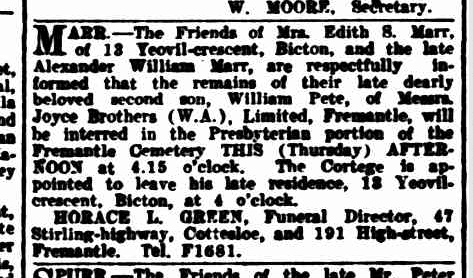 The first article I found was another death notice, and the funeral notice, for William Peter Marr. The articles about William’s death that I shared yesterday showed he had an older brother, James Alexander Marr, and the death notice I shared yesterday showed he had a sister Thelma, who married Cecil Sampey. This death notice gave me the names of 4 more children of Alexander William Marr. Then, I found the death notice for Alexander William Marr. I then searched at ancestry.com.au for a Thelma Sampey in Western Australia, and found a number of entries in the Australian Electoral rolls collection. I also found her death entry which showed that Thelma May Jeanette Sampey died in 1964 at Fremantle, age 57. Her parents were listed as Alexander J and Edith S. (registration no 24). I then found a marriage entry for Thelma M. Marr in 1928 at Fremantle (registration no 332). The Western Australian Online Indexes confirmed that she had married Cecil R. Sampey. I then went looking for records for Lily Marr, and found a marriage entry for Lily H. Marr to Edward J. Field in 1931 at Fremantle (Registration number 237). I was then able to find entries for a Lily Harriet Field on the Electoral rolls at Ancestry, and then her death entry. Lily Harriet Field died in 1956 at Fremantle, aged 48. Her parents were Alexander W. and Edith S (Registration number 241). I was able to find son James as well on the Electoral rolls, and his death entry. James Alexander Marr, died in 1966 at Fremantle, age 56, parents Alexander W. and Edith S (registration no 655/66). There was a Murton John Marr who appeared on the Electoral roll in 1943. He was living at the same address (Aberdare Street Bicton) as Edith Selina Marr. Also at this address was Harry Miller Marr. A Murton J. Marr was married in 1941 at Fremantle (Registration number 444). A Harry M. Marr was married in 1949 at Fremantle (Registration number 156). I searched Trove to see if I could find any mention of him, but there were no results. Harriet L. Marr born in 1908 at Perth (Registration number 502). The death notices had mentioned another daughter. I have not included any of the records I have found for her, as she may still be alive. James Alexander Marr was living in 1949 at 63 Petra Street East Fremantle (he was a mattress maker). Also at the address was Laurel Joyce Marr. I had already found the entries for Alexander William Marr, Edith Selina Marr, and William Peter Marr at Fremantle Cemetery.